Goat Science and Production is the first text in several decades to present comprehensive, state of the art information on goat science and production practices from an international perspective. Including information on meat, dairy, and fiber goats, chapters are organized logically to facilitate fundamental understanding of goat anatomy and physiology as well as practical production applications. Goat Science and Production begins with an overview of current global production, giving the reader necessary context to enhance subsequent chapters on breed variety, genetics, animal evaluation, and functional anatomy and physiology. Later chapters expand on these concepts highlighting practical application affecting feeding practices, health and disease management, and housing requirements. Information on milk, meat, and fiber production is also addressed, along with a key chapter on formulating a business plan and marketing strategy. The book concludes with a thorough discussion on further needs in research and education providing direction for future progress. 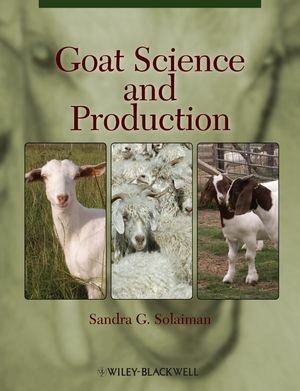 Goat Science and Production is globally contributed and provides an essential introduction and reference for students, researchers, outreach personnel, and producers world-wide. Sandra G. Solaiman, PhD, Professional Animal Scientist, is Professor of Animal and Poultry Sciences and Director of the Small Ruminant Research and Education Program at Tuskegee University, AL. She is also an Adjunct Professor at Mississippi State University, MS, and Auburn University, AL.